We perform puppetry for stage productions, both in scripted and improvised theatre. 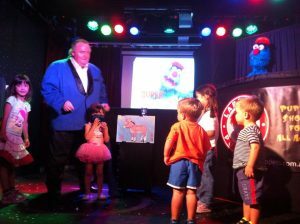 Our blue monster star Troggg will appear in any production, or Brett Hansen can puppeteer characters that you have created. If you have a cast of performers without any prior experience with puppets, Brett can provide puppetry training and supervision throughout the rehearsal period. Avenue Q is an American Broadway stage musical conceived by Robert Lopez and Jeff Marx. It is an adults only parody of Sesame Street, and won the 2004 Tony Award for Best Musical (beating Wicked). 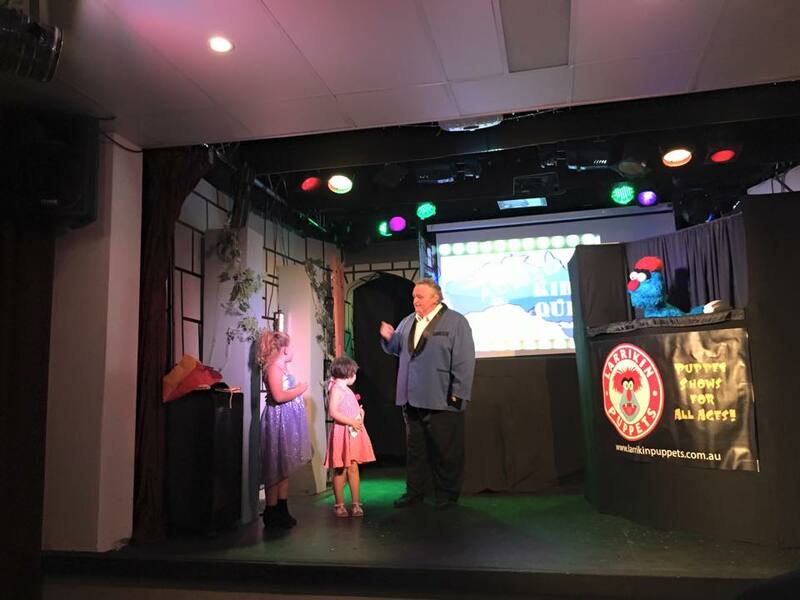 Our own Brett Hansen was “Puppetry Consultant” (providing puppetry training to all puppeteer cast members) and performed as part of the 2012 Brisbane cast. 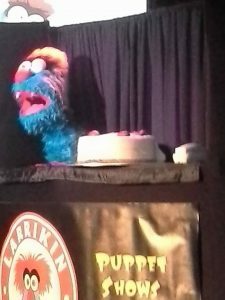 Brett co-puppeteered the characters Trekkie Monster and Nicky, and also performed two dancing rats. 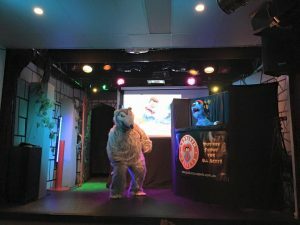 Brett provided puppetry training again for completely new Brisbane casts in 2014 (also at the Brisbane Arts Theatre), and in 2017 at the Sunnybank Theatre Group. 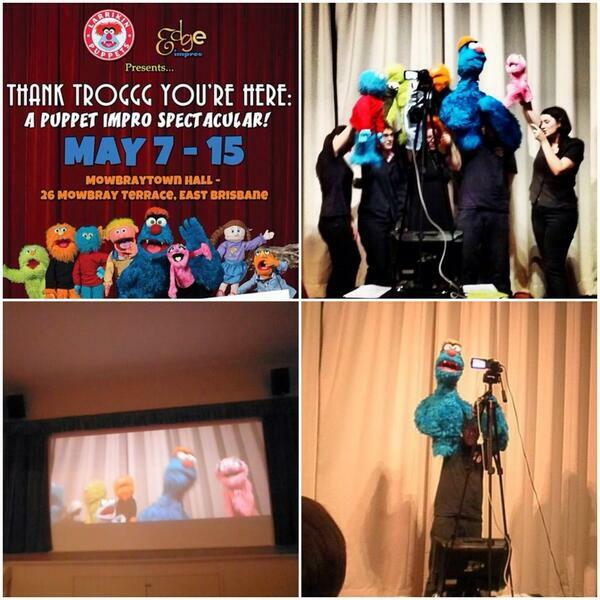 A co-production between Larrikin Puppets and Edge Improv, Thank Troggg You’re Here: A Puppet Impro Spectacular! is a comedy variety show that combines short-form improvised theatre scenes (think Whose Line Is It Anyway?) 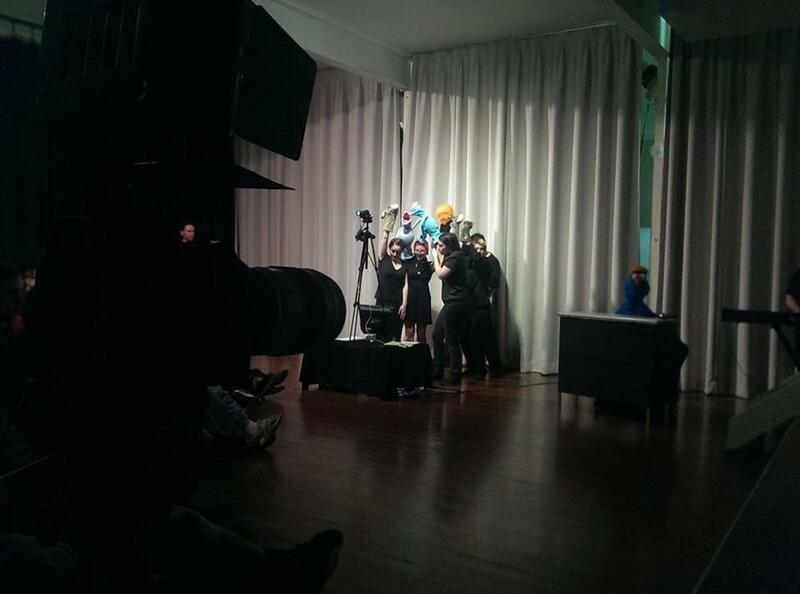 with puppetry in the TV style of Jim Henson (The Muppets, Sesame Street). 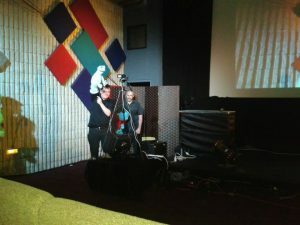 Performers improvise outside of their own body, and into the body of a puppet, playing within the space framed by a video camera’s lens. 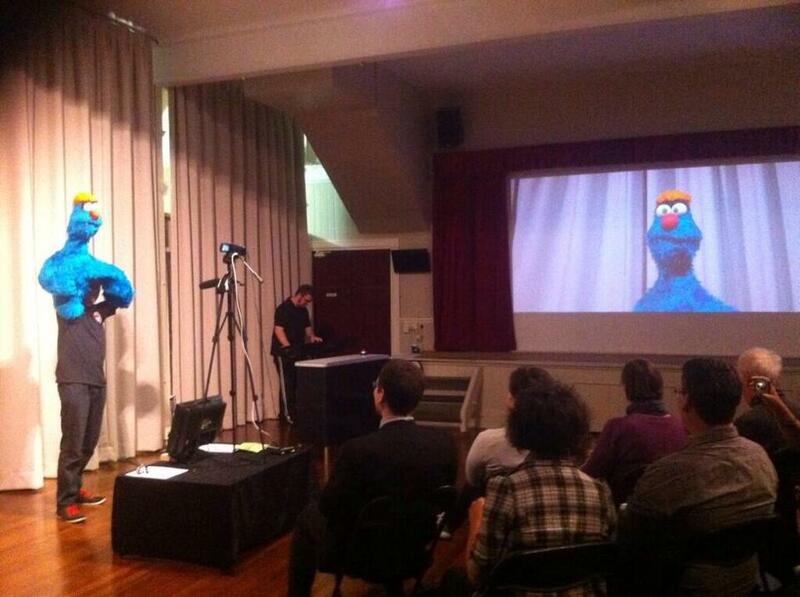 The audience can watch the puppets projected onto a screen, as well as the performers live on stage below them. 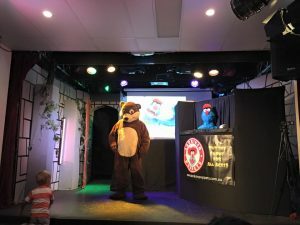 Thank Troggg enjoyed a successful season in May 2014 at Mowbraytown Hall (East Brisbane), as part of the Anywhere Theatre Festival, and has since been performed at New Globe Theatre (Fortitude Valley). This is a full cast production with a lot of challenging technical wizardry behind it. We only perform this show in theatres, cinemas or halls, preferably with seating. An inbuilt movie screen is always a bonus too. 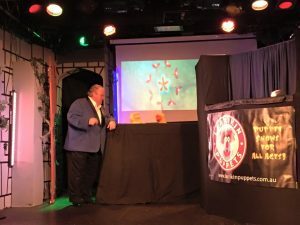 A booking of this production would need to cover the cost of nine puppeteers, one musician, a van load of film and TV camera and projection equipment, lighting gear, piano keyboard gear, and puppets. If you’re a venue, theatre festival or comedy festival wishing to book this show, we’d be happy to discuss dates, details and rates. See below for credits and video links. Performers: Brett Hansen, Brad Daniels, Rachael Whitaker, Chris Spensley, Leanne Shellshear, Sam Clifford, Lucy Posner, Rikki Strachan, and Brutal Planett. 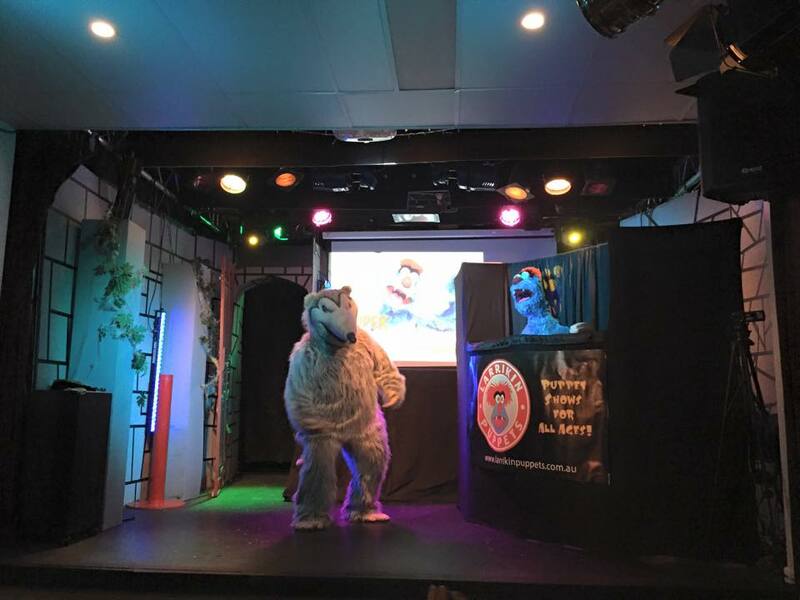 Hosted by Troggg with three Gs – Brisbane’s most charismatic blue monster compère. Photography: Kris Anderson from “Images By Anderson”. Time: Doors/Seating 6:30pm for a 7:00pm show starting time. Rating: (PG) Some humour and references may be of a mature adult nature, so parental discretion is advised. A co-production between Larrikin Puppets and Studio Theatre & Cafe, The Super Weekend Show is a Saturday morning children’s variety stage show featuring puppetry, competitions, prizes, magic, music, animation, comedy, colour and loveable characters. Hosted by Troggg, this is one hour jam packed with entertainment! Plus, no two shows are the same. Duration: Approx. 1 hour (No Interval) . Performers: Brett Hansen, Damien Lee. Audiovisual and lighting: Bradley ‘Sparky’ Clarke.